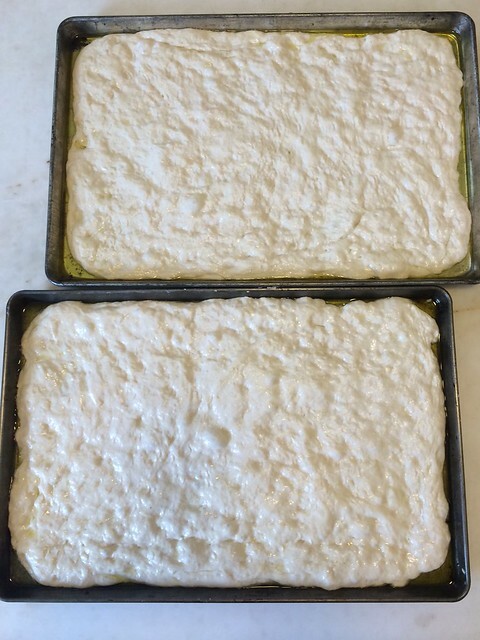 Another effort at duplicating Liguria Bakery "pizza" focaccia. 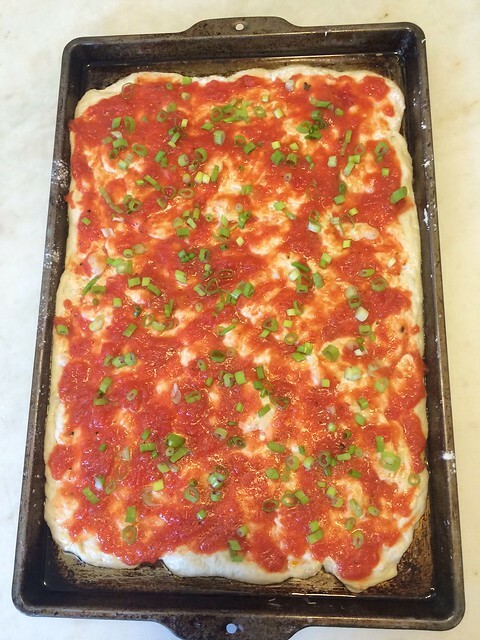 This time, used 18 hour dough, stretched out on an olive oiled pan, proofed an hour, sauced with canned tomato/olive oil + green onion. The closest I've come yet. The crumb was a lot closer to what I am aiming for: open and not "bready". I was not entirely thrilled by my sauce, but found that it tasted a lot closer to the real thing when the slab had cooled half an hour. (We're an impatient lot!) Will continue to work on this. 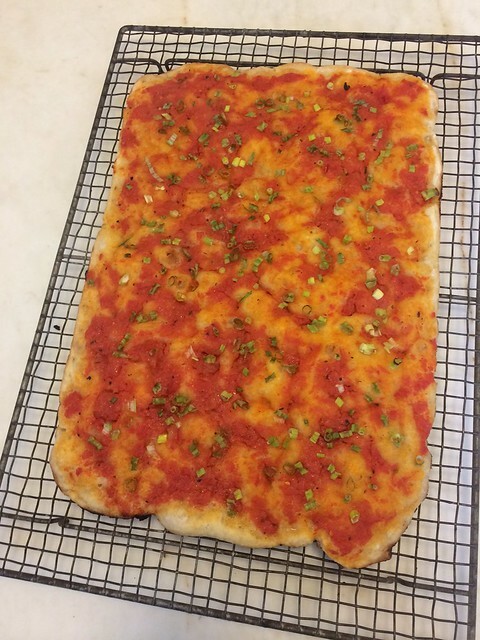 made a mistake while making pizza with 00 flour, today and accidentally found a nice texture for focaccia. add an egg. made the dough less bready. i add an egg for gf pizza dough and forgot that i was using wheat flour, since it's been about a decade and absentmindedly added the egg. You can eat wheat now? Hooray!!!!!!!!! Looks great - oh, to be able to turn my oven on to 500℉; fall is just around the corner, one hopes. Interestingly, though I haven't tried it yet, I was able to find a pizza stone that fits into my Cuisinart...I will attempt some focaccia/pizza soon in the little oven that could. Re: the sauce. I really like the Muir Glen product (or a very high quality true San marzano, obv), and I usually whir the can up with some olive oil and salt, before using it as you've used it above. Um, where did you find that pizza stone? FWIW, 'joe', the dough was stretched out on a pan heavily coated with olive oil, like a quarter of a cup. 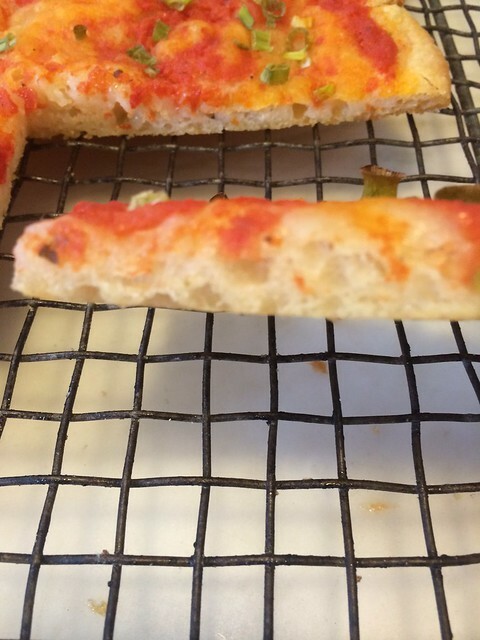 This not only helped with the shaping but had much to do with the proper texture of the bottom crust, that slightly oily but crisp crust we expect from focaccia. It is baked right on that oily pan and not moved to a stone or other pan. Try the stone, but you might want to wait for Fall and use your oven. 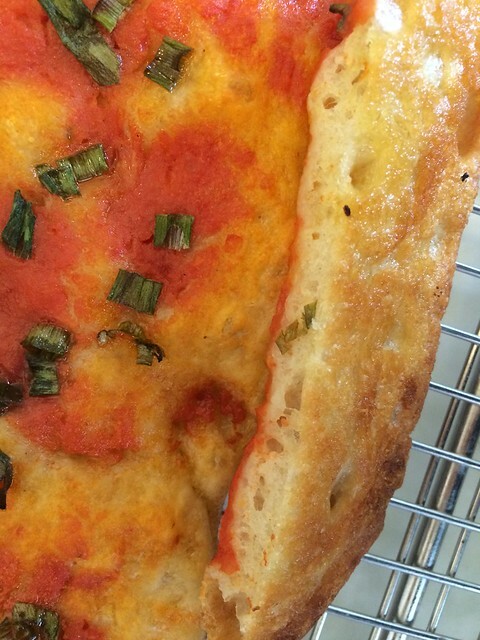 It was the first time I had made it this way and the results were startlingly better than baking it like pizza. Interestingly, this morning the sauce had morphed into an almost exact replica of Liguria's, so I won't make too many changes in the future. They are not the equivalent of, for instance, heating a 25 lb. baking steel in a conventional oven. 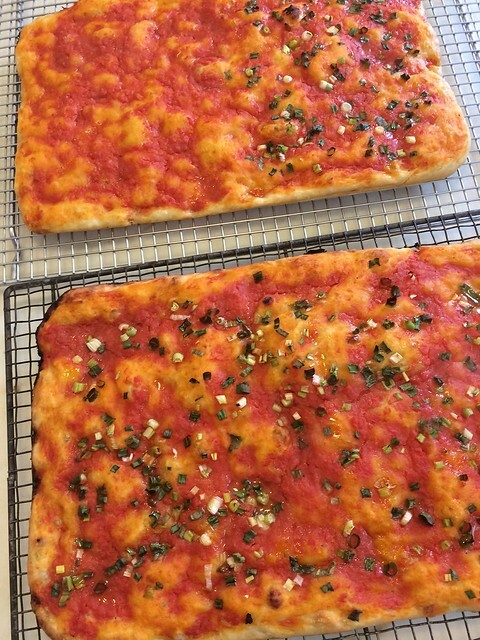 Yeah, when I bake focaccia, I generally do it on a rack as opposed to directly on the steel. Depending on what I want the final product to be like, I'll sometimes move it to the stone after 10 minutes or so. Family coming over this afternoon to celebrate my birthday. So I made myself a cake. 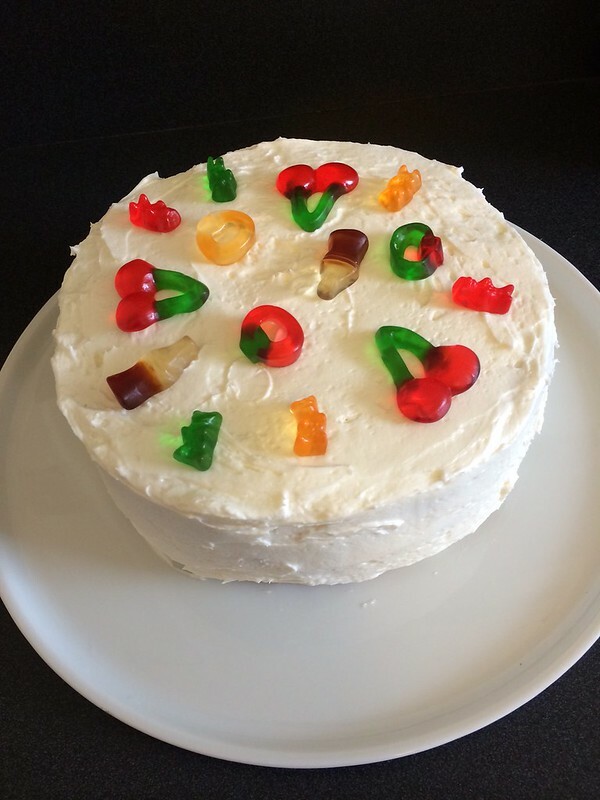 Lemon with lemon frosting and gummies. Husband says I'm nuts but he should already know that. Made two focaccias for them also, one with half no onion for the kids. Enjoy your wonderful cake and time with your family! Happy birthday, Voyager! I bet the grandkids will appreciate the gummies as much (or maybe even more) than you do! A old friend goes for a several mile walk every day before dawn. About once a month, he loops past our house around 6:30 for coffee. I try to have some kind of warm bread just out of the oven. This morning, raisin foccacia. Dough set last night, stretched out in pan around 5 this am, proofed an hour and baked. Pot notes for next time: Wetter dough; fewer raisins; tiny amount of sugar in the dough rather than cassonade on top; shorter bake; cut with scissors rather than pizza wheel.